Pictures too small? Click Here for the higher-bandwidth version. The Crown Vantage Powerhouse was the last building to go when the mill was permanently shut down. 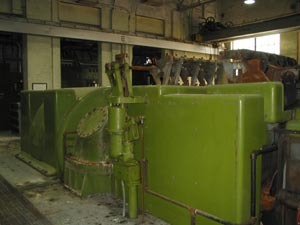 The powerhouse was kept running to provide heat for the mill for several months after the mill was finally shut down on November 3rd, 2003, in the hope that a buyer could be found to operate the mill once again. However, no buyer was found, and the powerhouse was eventually shut down as well. A few weeks before the powerhouse ceased operating, I knocked on its door and spoke with one of the last few people who worked there. I guess he knew he really had nothing to lose in terms of job security (or maybe it wouldn't have mattered anyway), so he was kind enough to give me a brief tour of the powerhouse. Although only the small heating boiler was operating at the time, the operation of the plant was still quite a sight to see. 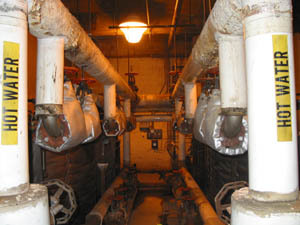 At the time of the powerhouse's closing, it contained one small and two large natural gas fired boilers, a 9.375MW turbogenerator, another turbogenerator of similar size (although unknown exact output), equipment to distribute steam to the mill buildings for heat and for paper machine operation, a water treatment plant (for the boiler feedwater), and the other various auxiliary equipment necessary for the operation of a power plant. 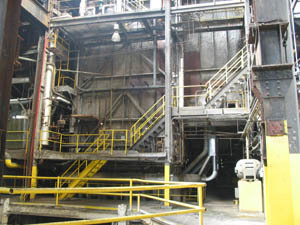 The plant also contained equipment providing an electrical interconnection with Consumers' Energy, the local utility company. The powerhouse was then responsible for the distribution of electricity, heat, and machine steam to the entire paper mill complex. None of the equipment in the powerhouse (with the possible exception of some machinery in the boiler room) appears to have been altered or removed between its shutdown and June of 2003 when I took these pictures. 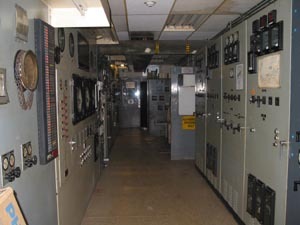 At the time these pictures were taken, the auction personnel had evidently turned on a few more circuits than just those providing lighting, so the noise of a few small machines in various areas of the powerhouse was audible, adding to the general atmosphere of the place. Click here to return to the Crown Vantage homepage.